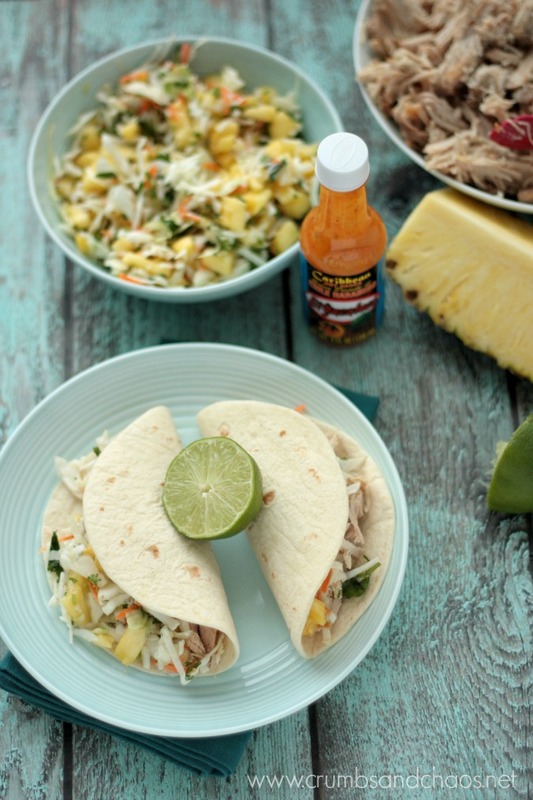 Tacos are perfect for watching the big game, these Slow Cooker Caribbean Pork Tacos are easy to make and so full of flavor! Any football fans out there? ‘Tis the season for all things football and, for me, that includes food! What are your favorite foods to enjoy while watching the big game? I’m never one to turn down a delicious appetizer, but you also can’t go wrong when you serve up anything in taco form – people can make their own at their leisure and sit down to watch the game. 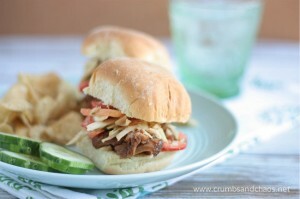 Today’s recipe is a flavor packed Caribbean Pork Taco made right in your slow cooker! The bonus here is that you hardly have to do any work. The star of this dish is El Yucateco Hot Sauce. It gives this recipe a unique heat that isn’t overwhelming and not too spicy. 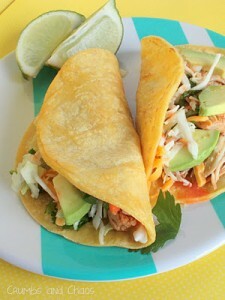 I used the Caribbean Habanero Sauce – made from yellow habanero peppers and carrots, its slightly sweet flavor and mild heat was the perfect addition to these pork tacos. I like things moderately spicy and the heat level in these tacos was somewhere between mild and medium, which is great for most crowds. 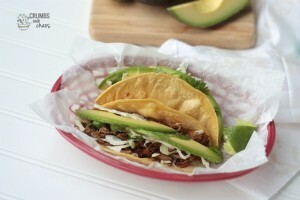 My kids enjoyed the meat only in their tacos without any mention of it being spicy. We’re using Pork Loin Roast because it’s a little leaner than pork shoulder. Cut the roast into 4 equal sized pieces and place in the crock pot. Add chicken broth, garlic, onion and El Yucateco Caribbean Hot Sauce. Cook on low for 8-9 hours. Remove from the crock pot and shred. Meanwhile, prepare pineapple slaw. 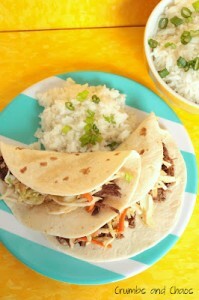 Then you’re ready to make tacos using the shredded pork and pineapple slaw. 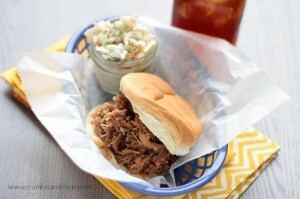 See, that’s super easy game day food! Do you get all jazzed up in support of your favorite team? You can do that for your favorite hot sauce too! Just head over and visit the El Yucateco Gear Store to find great items for both men and women to show your love for all things El Yucateco all year long! Cut the pork roast into 4 equal sized pieces. Place in crock pot. Add chicken broth, garlic, onion, El Yucateco Caribbean Hot Sauce and salt. Use a tongs to stir things a bit. Remove meat from crock pot. Shred with forks and place in serving bowl. Add a some of the liquid from the crock pot to the meat to help add moisture when reheating. Serve immediately or cover and chill until serving. In a medium bowl, place coleslaw mix, chopped pineapple and cilantro. Toss to combine. In a small bowl, stir together lime juice, olive oil and El Yucateco Caribbean Hot Sauce. Pour over slaw mixture and toss to coat everything. Warm tortillas according to package directions. 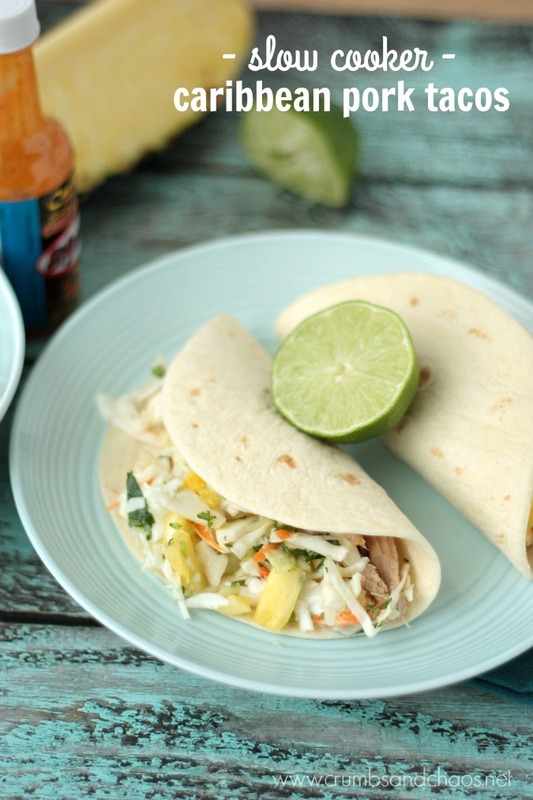 Fill each tortilla with Caribbean pork and top with pineapple slaw. Serve immediately. 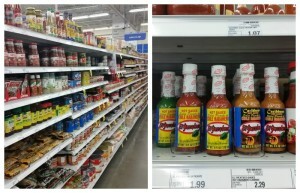 At my local Meijer store, I found El Yucateco Hot Sauce in two places – the condiment aisle and the Hispanic foods section. Meijer carries the Red, Green or Caribbean Habanero flavors. Visit the El Yucateco gear store and find cool gear to show your love of El Yucateco. They have things there for men and women and all seasons! How do you add flavor to your favorite dishes using El Yucateco Hot Sauce?